Every year, Cintas Corporation, a leading designer and supplier of janitorial and industrial, safety, and fire-prevention supplies, sponsors a Janitor of the Year contest to honor the workers who keep schools running. Nominations and voting are open to the public. Ten finalists are chosen from schools around the nation by a judging panel from US Communities and Newell Rubbermaid, Inc. The winner gets a $5,000 cash prize and $5,000 credit towards Cintas and Rubbermaid Commercial Products and services for his or her school. The other nine finalists receive $500 cash prizes. The 2017 contest, Cintas’s fourth, kicked off on January 30 and ended on April 14. One of the ten finalists was Michael Eldridge of Deer Crossing Elementary School in Frederick County, New Market, Maryland. Much more than a janitor, he's a beloved member of the school staff—a teacher, mentor, and friend to the nearly 800 students. He enjoys teaching basic ASL to faculty and students, devising secret handshakes, and helping to make Deer Crossing a safe and welcoming place. Eldridge is from Philadelphia, and grew up in a hearing family. He enjoyed playing football and was interested in architecture. 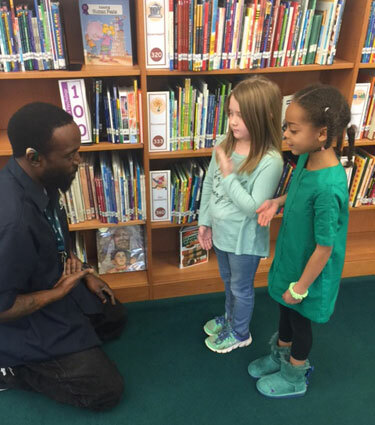 Ten years ago, as he told us, he took a custodial position in a government building in Philadelphia, and when he relocated to Maryland, applied for a similar position with the public-school system and was hired at Deer Crossing Elementary in 2012. He especially enjoys working outdoors, on landscaping. But overall, he says, the best part of the job is "interacting with the children and ensuring that they have a safe place to learn and grow." As for the Cintas contest, Eldridge didn't win the grand prize, but in our eyes, he's a champion.